Valid from Buda location only and carryout only. Expires 1/31/15. Both eGift Certificates will be in a pdf format that can be printed out. 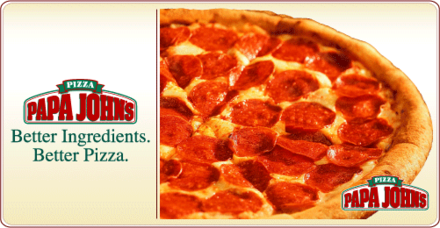 2 eGift Certificates, each valid for a Large 1 Topping Papa John’s Pizza. Use this deal to order a Large Papa John’s Pizza with your favortie topping and give the 2nd certificate as a gift or just use it to save extra money. Certificates valid from the Buda location for carryout only. These make Great Gifts! The price you paid & discount will not show up on the certificate.